Because of the sad lack of stitching happening around Chez Magpie over the past few days, I regret to inform you that there will be no pictures today. This one is time-sensitive and you will need to act quickly if you are interested. Kathy Shaw (Shawkl) has opened up new registrations for her Intermediate On-Line Crazy Quilting course. It's free and the only pre-requisite is that you have taken her Beginner's Class. Registrations close March 1st, so hurry!! Go HERE. For those of you who use your sewing machines a lot, perhaps you have run into issues with your bobbin not acting the way it should. There is an excellent article HERE about what to do to fix the problem. My friend Pam, of KittyandMeDesigns, has posted a great tutorial on the use of shibori ribbon in your crazy quilt pieces. Go HERE for that. While I was exploring new-to-me blogs during the 'Grow Your Blog' hop, I 'met' a wonderful Canadian artist named Judy Cooper and loved her work. She just posted about a jaw-dropping garden-themed sewing box that she created and I know you will love seeing it HERE. While you're there, be sure to scroll down and see her hussif! Today your quote is from Bertrand Russell Delong...... "The most valuable things in life are not measured in monetary terms. The really important things are not houses and lands, stocks and bonds, automobiles and real estate, but friendships, trust, confidence, empathy, mercy, love and faith"
I'm a lucky lucky girl!! Today's quote is from David Viscott.... "To love and be loved is to feel the sun from both sides"
Today was our monthly CQTeers meeting and, being that it was here, it was my turn to come up with something to make/create/do. After falling head first down the rabbit hole that calls itself Pinterest for altogether too many hours to count, I came up with a recipe for a lovely hand scrub. It's one of those really nice little treats that ends up costing next to nothing to make and yet makes you feel so good! Win/win....right? So....for lack of anything else to mumble about, I will share the recipe so you can make some too! * or, do like I did and leave your mind at the door of the dollar store and forget to buy pretty jars and end up having to scrounge some plain jane canning jars instead....oops!!! Today's quote is from Quentin Crisp.... "There is no need to do any housework at all. After the first four years the dirt doesn't get any worse"
A pincushion and a needlebook. The pincushion will fit perfectly in the 'spine' area of my hussif (which explains why it's long and skinny!). I edged the needlebook with a row of buttonhole stitches and then crocheted a filet trim using the buttonholed stitches as a base. Today the quote is from W. J. Boetcker.... "If you want to know how rich you really are, find out what would be left of you tomorrow if you should lose every dollar you own tonight"
Carol asked me in the comments yesterday to share how I made the magnetic needle keep and then asked if the tutorial HERE was what I used. Actually the tutorial she found is far better than the one I had seen (and have subsequently lost the link to). So, if you'd like to make one this will tell you exactly how it's done. I purchased my coverable button kit at Fabricland, but I would assume that places like JoAnn's in the US would have them. Mine were made by 'Unique.... H.A. Kidd' and measure approximately 2" across. I have several different versions of coverable buttons and would recommend that you try to get the ones that have little 'teeth' in the back of the button top. It makes holding the fabric in place SO much easier. I bought Rare-Earth circular magnets from Lee Valley Tools here in Canada (http://www.leevalley.com/en/wood/page.aspx?p=32065&cat=1,42363,42348 Order # 99K32.03 3/8" diameter; 1/10" thickness (your local hardware store may have them as well). I would highly recommend these magnets because they are very strong and will easily 'work' through the metal button cover and the fabric you use. I'm not positive, but I would be suspicious that the cheap dollar store ones wouldn't be strong enough. I used two magnets in my needle keep. My friend Pam Kellogg has posted part 2 of her tutorial regarding the use of Broderie Perse (Broiderie Perse) in your crazy quilts and you can see that HERE. How be you give it a try and send your photos of what you do to Pam? We would love to see!! I have completed a couple more things for the 'innards' of my hussif. I know this hussif is seeming to take absolutely forever to get done, but it's getting there - I promise! First of all, I made this needle keep. It's a large button blank covered with embroidery and inside I glued a couple super heavy duty magnets (tricky little beggars to get to stay in place while the hot glue dried - they kept wanting to leap together like bunnies in heat). As you can see a needle sticks very nicely to it and won't be so easily misplaced while I'm working. Of course, having said that, the secret to success is going to be training my brain into actually putting the needle onto it! This little creation is a crocheted thimble holder. Being that I don't actually USE thimbles it's rather a waste of space in my hussif, but that didn't stop me from making it. I just like the look of it! Today the quote is from William James.... "Be not afraid of life. Believe that life is worth living, and your belief will help create the fact"
Remember the other day when I showed you the pile of 2 1/2" strips I had cut for the sane quilt and my mentioning a wondrous piece of equipment my friend had loaned me to make the process easier? I thought perhaps you might like to see what it is, just in case it would be of use to make your quilting life a bit easier. It's a clear ruler with slits already in it where you run your cutting wheel thereby making each cut straight as can be and because there are six slits each 2 1/2" apart you can cut quite quickly and accurately without having to keep moving your ruler. Sorry about the picture quality - still learning my way around the new computer and haven't mastered the photo program yet! This pocket will hold a pad of paper on the inside of my hussif. If you embiggen the picture you can see more of the details and will notice the 'crystal' in the upper corner. My mother painted the roses on that many moons ago and it's been in my stash waiting for a home. I think it found one! I just used the Random.org generator to choose the winner of my 'Grow Your Blog' party giveaway and it chose comment # 32 which was Laney of Sugar Plum Patchwork!! Her comment..."I came from the blog hop. Beautiful crazy quilt pieces! Thanks for visiting my blog - it was surely a treat to see yours!" I'm sending an email off to you Laney and will send your wee prize off to you once I receive your snail mail addy. Thank you to everyone who visited my blog and were kind enough to leave a comment. It has been a fun blog party and kudos to Vicki and her helpers who made it so special. If you're here for the 'Grow Your Blog' party, my post is HERE. Before I get into the main part of the post I want to tell you that I've noticed something odd going on with my blog comments. Up until recently I have always received a copy of each comment in my email account so that I can approve them (dratted spammers!!) and from there I am able to respond to you directly. For some reason, known only unto Blog-grrrr or the blogging universe as a whole, I am not getting all your comments forwarded to my email and in a lot of cases I haven't responded to you because I didn't notice there was a problem until now. Being rather computer illiterate I don't know what I can/should do to rectify the situation. I haven't changed any of my blog settings so it can't be that. ANYWAY - my most sincere apologies if I haven't responded to you and please know that I do love your comments and treasure each and every one. I am still able to approve comments through my blog directly so I will be continuing to do that so rest assured your comments ARE being seen by me. For those of you who are interested in crazy quilting Kathy Shaw has posted a listing of her registration dates that are coming open throughout 2015 for her free (yes, you read that correctly!) online classes. For the registration dates you can go HERE; for general information regarding her classes you can go HERE; and for the class supply lists go HERE. Although I haven't taken any of Kathy's classes as yet, I know from what I've been seeing from the various bloggers who have that her classes are great. For those of you who love eye candy of the crazy quilted kind there are a ton of pictures to be seen at CQMagOnline which, alas, is now defunct. Fortunately the articles and pictures are still available and it's definitely worth pouring yourself a cuppa and spending some time exploring. You can go HERE for links to the photo galleries and THIS link will take you to the articles section. You will see a list on the left that will lead you to each issue of the magazine. 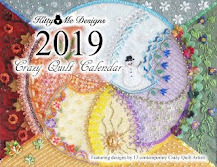 And, just a little reminder that you can click on the picture of Pam Kellogg's 'Crazy Quilt Quarterly' magazine in my right sidebar to purchase your very own drool-worthy copy and to see what she and I have been up to lately. Phew, now you've gotten through all that, I will leave you with today's quote (from Ambrose Bierce).... "Speak when you are angry and you will make the best speech you will ever regret"
Today I'm going to show you something that I probably shouldn't! Don't we all like to think that everything we do is pretty decent and that we don't make horrible mistakes? W-e-l-l - me? Not so much! Yesterday I spent over an hour cross stitching a rose onto the latest section of my hussif and when I removed the waste canvas I hated it. H-A-T-E-D I-T. What to do? Chuck the whole piece? Leave it be and live with it? Or....could it be salvaged? So in the interest of full disclosure AND actually having a blog post for you today, I decided I would show you what I've done to fix the problem. Can you see what had me bothered? (and, don't be nice and tell me that it's okay, because it really isn't). It's the big honking single rose that is seemingly lying on its side sort of on the upper right. I know I didn't have to tell you that, but bear with me. It's too big. It 'fights' with the broderie perse flower on the lower left. It's too much. I could have unpicked all those stitches, but it would have left a lot of holes in the fabric which would have been very difficult to cover up. Now, here's what I did to make it better. First of all I went to my stash and found something that had a pretty finished edge. My reason for that was (if you look closely at the photo above) that the 'bad rose' was stitched quite closely to the nice seam below it. You can also see that the broderie perse flower was 'higher' than the nice seam and because of that I couldn't simply stitch down a straight piece of fabric in order to cover up the bad area. The curve in the doily I chose worked perfectly to deal with the broderie perse being somewhat higher. Do you see in this photo how I've inserted the doily to cover the offending rose and also compensate for the broderie perse rose? I basted the curved edge of the doily very close to the edge. As you can see I was now left with a rather see-through doily in the corner. Because crazy quilt blocks are created on a foundation obviously I needed to replace the foundation in that area. That was simply done by basting a scrap piece of plain cotton onto the back. Now I am ready to continue with my block and I'm so much happier with it. Yes, I did lose the small seam treatment that was above the offending rose, but it was a small price to pay for ending up with something I am happier with overall. Today, here's a quote from Steve Allen.... "Sometimes things which at the moment may be perceived as obstacles - and actually be obstacles, difficulties, or drawbacks - can in the long run result in some good end which would not have occurred if it had not been for the obstacle"
Today I don't have any pictures of roses for you. I apologize. I let mundane things like running errands, eating, sleeping and general life get in the way of my stitching. I will try to do better. I promise. So...instead of pictures of my work, how about I send you to look at other things I've found intriguing about the internet world? - I found an interesting site that will print your blog into a book format at a very reasonable cost. I don't know about you, but I've often wondered what would happen if my blog suddenly disappeared into the ozone layer never to be seen again. Just think of all the pictures that would be lost. The record of my work. The memories. This might be worth thinking about and you can find information HERE. - For those of you that live in Canada and are looking for embroidery books to add to your library you might find THIS place interesting. She seems to carry some obscure titles that might be difficult to get elsewhere. I'm not sure how her prices compare to places like Amazon though. - There's a wonderful fabric collage tutorial over on Carolyn Saxby's blog HERE. She uses things that most of us already have in our stash. While you're visiting her blog be sure to check out her other posts. Her work reflects the area she lives in and it's incredibly beautiful. - Pam Kellogg has written an interesting post about the pros and cons of using hoops, frames or stitching in your hand HERE. Today's quote is from Andy Rooney.... "Computers make it easy to do a lot of things, but most of the things they make it easier to do, don't need to be done"
Well, the grand computer change-over of 2015 took place over the weekend and I'm now up and running on my new one...complete with a great deal of trepidation! Windows 8.1 is a whole new learning curve! So far I've managed not too badly (despite the great 'Skype Debacle Of Last Night' that we won't talk about, other than to say all's well that ends well - I think). Today I put my brave face on and am attempting to load a picture onto my blog. 1. Pam Kellogg has posted part one of her tutorial on using Broiderie Perse (sometimes spelled Broderie Purse) on her blog. We're hoping that you might give it a try in your crazy quilting projects and share the results with us. Go HERE to read the tutorial. 2. For the crocheters among you (knitters would find this interesting as well I think) who enjoy doing things for charity, perhaps you might like to do THIS. 3. There's an excellent video tutorial HERE about how to clean your iron. Further on this, I recently read a hint that you could use one of those Mr. Clean Magic Erasers, but I have yet to test it out. Oh - and the photo above? It's a pin keep that I made to include in my hussif. Today the quote I'm giving you is from Susan Jeffers (and 'fits' what happened during the afore-mentioned 'Skype Debacle')...."Feel the fear, and do it anyway"
IF YOU ARE HERE FOR THE 'GROW YOUR BLOG' PARTY, YOU CAN SEE MY POST HERE. Depending on your viewpoint considering snow vs. roses, you can decide for yourself which part of this post falls under 'yuck'!! If you embiggen the picture, I think you can see the BIG snowflakes that are falling (and have been for much of the afternoon). See the build-up on my windowsill? oh - and can you see a little mourning dove perched in the tree? He's hard to spot!! Meanwhile, inside, I have been continuing the work on my rose-themed hussif. Remember my post of a few days ago where I showed you the free-standing rose? Well, I wasn't happy with it so I've added a couple of rows of buttonhole lace (in two different shades of pink) around the outside of the petals and now I'm much happier. Above is the picture as it was the other day, and to the right is what I did today. Perhaps you can't see why I would 'fix' it, but trust me, when you see the overall project I think you'll understand! It's not a very great photo! The roses were done using cross stitch on waste canvas. The entire pocket measures approx. 5 x 4". Today I give you a quote from Clarissa Pinkola Estes.... "I hope you will go out and let stories - that is life - happen to you and that you will work with these stories....water them with your blood and tears and your laughter til they bloom, til you yourself burst into bloom"
Welcome! If you're here for the 'Grow Your Blog' party, my post is HERE. Today I have a couple of things I've been wanting to tell you about, so I'll do that before I get to the latest photos of what I've been adding to my rose-themed hussif. 1. Mary Corbett of NeedlenThread has a couple of posts on her blog that you might find of interest. The first one is an article about the different types of embroidery needles and how they are best used. Go HERE for that. 2. Mary also has done a tutorial on creating a really pretty beaded buttonhole edging that I can't wait to try. HERE's where you can see it! 3. Kathy Shaw has a post about some really exciting changes to her Intermediate Crazy Quilt online class and you can find further information on her blog HERE. She is so very generous with her classes (I have yet to take one, but I'm waiting for the beginner's class to open up again so I can!). As of now, the next beginner's class is open for registration on May 2nd, but I see a little note on her blog that maybe, just maybe, she might run another one in February. Oh...and did I mention that her classes are FREE (yes, you read that right!!). 4. 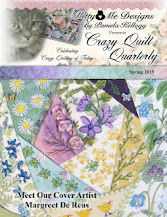 If you are looking for the link to purchase the 'Crazy Quilt Quarterly' magazine, have a look in my sidebar. Clicking on the cover picture should (if I did it right!) take you directly to MagCloud. This is the 'cover' of a pocket that will be on the inside of the hussif. Just plain ol' embroidery - nothing fancy! This is a smaller pocket decorated with silk ribbon flowers and some pearl beads. Today's quote is from Bruce Barton.... "When you're through changing, you're through"
If you're here for the 'Grow Your Blog' hop, my post is HERE. Now for the exciting news I have for you!! 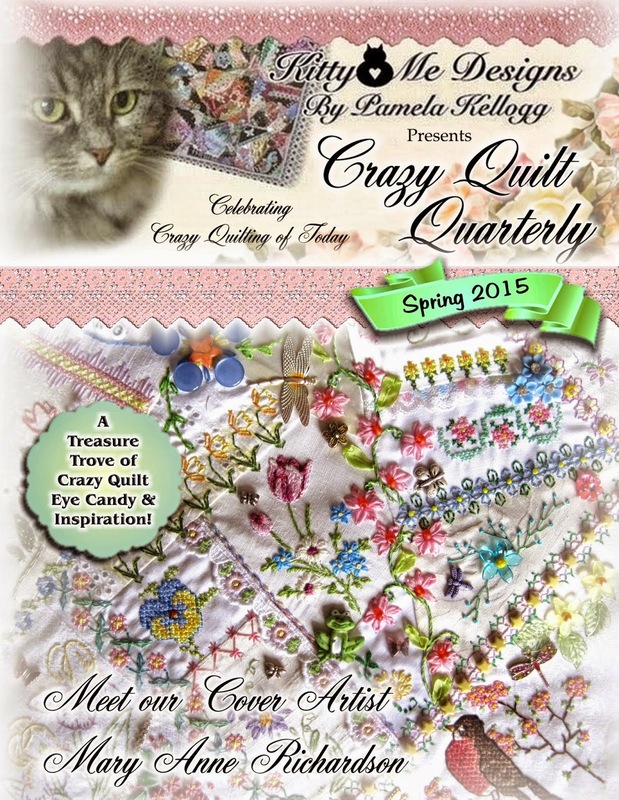 Today, at long last, the very first issue of Pam Kellogg's new 'Crazy Quilt Quarterly' magazine is being launched! We are so excited to show it to you! Pam has worked so very hard on getting this magazine ready, including having to deal with three different computers (and the resulting programs!) while she did so. Not only am I excited about the launch, but also to be the very first 'cover girl' - yes, my work is on the cover! Not only that, but I'm writing a column for newbies AND, even harder to believe, I'm the Assistant Editor!!! I never in my wildest dreams ever (ever!) would have thought I would be honoured in such a way nor did I ever think my work would ever be on the front cover of a magazine. Definitely better than showing up in the court docket, don't you think? Pam, Cathy Kizerian (Creative Consultant) and I have worked very hard to bring you a beautiful publication filled with articles about crazy quilting, eye candy, tutorials and much more. The magazine is available through MagCloud, which is an online print-on-demand business. You may purchase either a print or digital copy (or both! ), depending on your needs. This issue is available HERE or, if you would like, you may purchase a year's subscription and information can be found HERE for that.